I love Chinatown. I love my Chinatown, I love Toronto's Chinatown, I love New York's Chinatown - both Flushing and Manhattan. I love Chinatown so much, I've written a cookbook about the ingredients you find in Chinatown. That's how much I love Chinatown. Our own, just off Leicester Square, isn't huge. Three main streets - Wardour Street, Gerrard Street, Lisle Street - make up the main bulk of it, with smaller capillary streets running off and around it. It's rammed full of restaurants, shops, supermarkets and bakeries - it's never anything short of colourful and bustling. Here are the places I like to shop for ingredients the most. Down the same alleyway, is a teeeeny tiny shop that sells fresh vegetables. Apparently it's called Mrs Mao's, after the owner who grows the vegetables at her smallholding in Kent, but it doesn't have much in the way of English signage. Bok choi, chives, mustard greens, gai laan (Chinese broccoli) are all sold here, and in a way that you can choose your own portion rather than pre-bagged. Young Cheng Fresh Seafood Shop often sells crabs and lobsters straight from the tank, and pigs blood, clams, whelks, prawns and a variety of fresh fish from slabs of chipped ice. Back out on to Gerrard Street proper, Loon Fung is the largest of the supermarkets and I shop there for their butcher counter. There, you can buy tripe, minced pork, tongue, pork belly and various other bits, or they have a fridge section with it pre-packaged. This place is good for general Chinese stuff. New Loon Moon also stocks a lot of Chinese products, but their main specialism is Thai and Vietnamese produce. This is the place to go to buy herbs and vegetables like lemongrass, Thai basil, galangal and the likes. 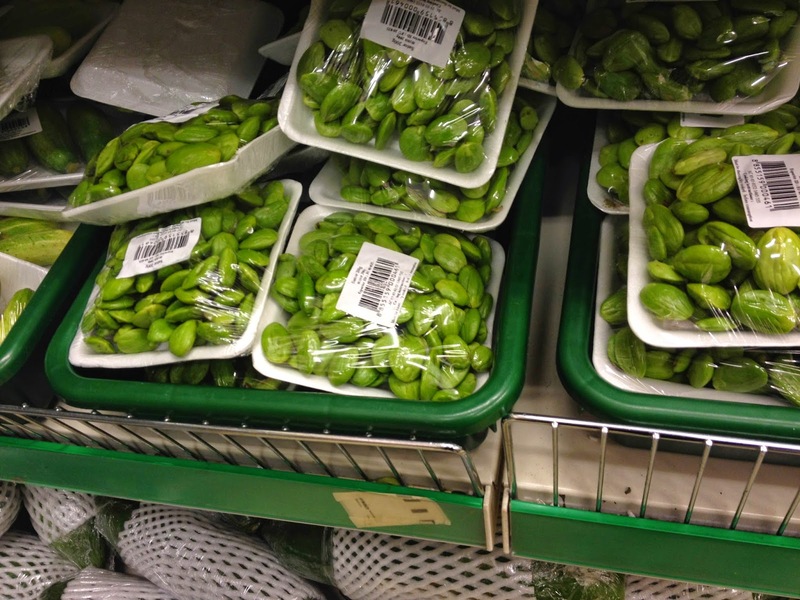 They also sell green peppercorns, krachai, Vietnamese hot mint and coriander, and even stinky petai beans. They have a vast Korean and Japanese dry goods section upstairs too. See Woo also has branches in Greenwich and Glasgow, and this tightly packed shop is where I buy my equipment (downstairs) and also has a great variety of vegetables. They're the only place I've ever seen that sells celtuce, and their greens always look fresh and perky. They also sell my favourite soy sauce, Pearl River Premium Deluxe light soy. Where do you like to shop? Where have I missed? Do you have any hidden gems? Do share! I'm so chuffed you know about the ho fun factory - my parents have always bought it from there, and that's at least 30years! Paul - Great tip, thank you! Lucy - what a coincedence! I look forward to your restaurant post. A post close to my heart, as I'm a total Chinatown geek too! From childhood visits to Manchester's to regular trips to London's as a grown-up. And probably, like you, I also make a point of visiting Chinatowns on my travels with Bangkok probably my favourite. And next time I go to NYC I wanna go to Brooklyn's so that I can boast that I've been to ALL three main NYC Chinatowns! Anyway, my fave Chinatown shopping haunt is New Loon Moon, as I think the vegetables are the best quality. I'm also a big SeeWoo fan, as I think they probably have the best range of noodles. PS: There are also branches of Wing Yip in Birmingham and Manchester. Oh My God, get me to Lo's noodle factory like now! We've been making our own ho fun to satisfy our mega Pad See-Ew cravings. Dear Wilkes pointed us in the direction of little alleyway shop selling Mao's Kent grown Chinese herbs - X. Next time I'm in town stocking up on stink beans I'm going to load up on ho fun. High fives for the tip off!